Fancy green diamonds, like fancy red diamonds, are exceedingly rare and valuable. Natural green diamonds can be grouped into two classes: those which possess natural body color, thus exhibiting a uniform green hue throughout, and those whose color is limited only to its surface, commonly called skin stones, where the source of green color is caused by remnants of radiation impressed on the "skin" of diamonds. Most natural green diamonds are skin stones, making body color green diamonds prohibitively rare and valuable. The most famous and largest known green diamond that exemplifies body color is the historic 40.70 carat Dresden Green. A highly valued and greatly admired stone, 100% natural green diamonds. The color is a direct symbol of nature and symbolizes growth, harmony, freshness, and fertility. Natural fancy green diamonds owe their color to radiation exposure that unfolded after they formed and traveled to Earth's surface via the volcanic pipe. However, the downside of being submitted to radiation is that only those portions of the stone that come into direct contact will show green color, thereby resulting in a diamond with uneven color. As rare as green diamonds are, a diamond with uniform green color is absolutely uncommon. A green diamond's color is determined by three factors: (1) the kind of radiation the diamond has been subjected to; (2) how long the exposure lasted; and (3) diamond size. Alpha radiation tends to affect only the surface of the diamonds, resulting in skin stones where the green color is oftentimes wiped out as they are cut and polished. Beta and gamma radiation, on the other hand, will infiltrate the green diamonds more deeply, thus producing diamonds that exhibit much greener color with uniform color distribution. Fancy green diamonds that are the product of beta and gamma radiation are truly unique - incidents of this nature take place less than 0.1 percent of the time. Green color diamonds can be found with single, pure color, but most often contain one or even two secondary hues. The various overtone colors of a green diamond found are Green, Yellowish, Blue, Bluish, Brown, Brownish, Grey, Grayish, Gray Yellowish, and Grayish Yellowish. From left to right: Faint Green, Very Light Green, Light Green, Fancy Light Green, Fancy Green, Fancy Intense, Fancy Vivid, and Fancy Deep. 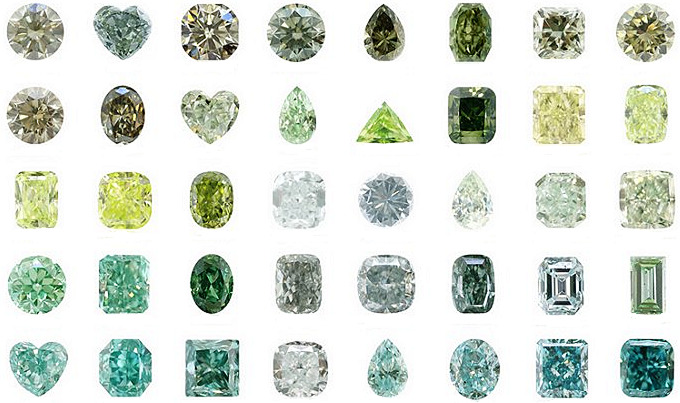 The further along this spectrum you go, the richer and more intense the green is to be seen in the diamond. The more intense a diamond's color saturation, the more it will be worth. For example, a Fancy Intense Green diamond will be worth more than a Fancy Green diamond. That said, apart from very saturated pure greens, stones that are a split grade containing another truly rare color of highest saturation, such as Fancy Vivid Blue Green, are among the most desirable and valuable types of natural green diamonds. 1st row: Fancy Light, Grayish Green Chameleon, Fancy Grayish Green Chameleon, Fancy Deep Gray, Yellowish Green Chameleon, Fancy Dark Gray Yellowish Green Chameleon, Fancy Light Grayish Yellowish Green, Fancy Grayish Yellowish Green. 2nd row: Fancy Gray Yellowish Green, Fancy Dark Gray Yellowish Green, Fancy Yellowish Green, Fancy Intense Yellowish Green, Fancy Vivid Yellowish Green, Fancy Deep Yellowish Green, Fancy Light Yellowish Green, Fancy Yellow Green. 3rd row: Fancy Intense Yellow Green, Fancy Vivid Yellow Green, Fancy Deep Yellow Green, Faint Green, Very Light Green, Light Green, Fancy Light Green, Fancy Green. 4th row: Fancy Intense Green, Fancy Vivid Green, Fancy Deep Green, Fancy Gray Green, Fancy Grayish Green, Fancy Deep Grayish Green, Fancy Light Bluish Green, Fancy Bluish Green. 5th row: Fancy Intense Bluish Green, Fancy Vivid Bluish Green, Fancy Deep Bluish Green, Fancy Light Blue Green, Fancy Blue Green, Fancy Intense Blue Green, Fancy Vivid Blue Green, Fancy Deep Blue Green. The green diamond has a very strong emotional correspondence with safety as it is the most restful color for the human eye. Green suggests both stability and endurance. However Aqua green is associated more with emotional healing and protection while Olive green is the traditional color of peace. This is the reason why so many adore green color diamond jewellery in different types of pieces, such as earrings, rings, and pendants. The green color, which is caused by exposure to atomic radiation or radioactivity, is extremely unique. So much so, that it is actually somewhat difficult to determine whether a green diamond is natural or treated. Many polishers purposely leave what is referred to as a Natural along the girdle of the stone. The purpose of the Natural is so any diamond associations, such as the GIA, can identify the natural color of the stone and thereof award it a certified diamond certificate. Tone refers to the lightness or darkness of a green diamond, and the continuum in between. GIA grading does not make a distinction in tones, but to the eye a stone with darker tones may appear more intense in color. For someone looking for the appearance of a Fancy Intense Green diamond without the price tag of one, a good option may be a Fancy Green diamond with a darker tone. It is moderately common for green diamonds to display fluorescence. Natural fancy green diamonds tend to exhibit fluorescence in one of the following varieties: medium to strong blue, strong green, strong yellow and strong white. In the final analysis, the enhancement to a stone's aesthetics that fluorescence offers is entirely subjective. All levels of clarity are possible in fancy green diamonds. As truly rare as IF, VVS and VS diamonds are, they are even more so when combined with fancy green color. Notwithstanding, a green diamond that falls on the lower end of the clarity scale is highly valued and rare as long as any major inclusions do not detract from the color and appearance of the stone. Because round cuts tend to produce lower color saturation, green diamonds, like other colors, are generally cut into fancy shapes such as pear shapes, radiants, cushions, etc. Round cuts cause color desaturation because they are best at reflecting white light, which also gives them their scintillation. In the case of green diamonds, a round cut may make the green color appear fainter, whereas a fancy shape, which reflects less white light, will maximize color saturation. Take note of uneven color distributions as well (these will be noted on your GIA certificate), as they can certainly affect a diamond's appearance and value. Natural fancy green diamonds have very high value. The most expensive of all green diamonds are those that are uniformly pure green without any secondary color modifiers. However, one allowance can be made regarding secondary color modifiers: any green diamond that is modified by blue such as Fancy Blue-Green or Fancy Bluish-Green is highly valuable and on par with pure green diamonds in terms of price per carat. A color diamond's worth is determined first and foremost by its color. As already rare and exclusive as fancy green diamonds are, the more intense the base color in a green diamond, the more valuable it will be. Green diamond price is driven by intensity. Stones that achieve intensities of Fancy, Fancy Intense and Fancy Vivid will command the highest prices among natural green diamonds. Of course, as the sizes increase, so, too, will their asking prices. A colored diamond is generally rare when it exists as one color without any modifying colors. Green diamonds can be found paired with yellow, brown, gray and blue. The only instance that color in fancy green diamonds can experience equal, if not greater, rarity and value than if such diamonds were to have just its primary color of green is when the primary green color is combined with comparably rare colors such as blue. A "fancy blue-green" of considerable saturation will command a very high price as this color combination is among the rarest. Fancy green diamonds originate from the mines of South America (Brazil, Guyana and Venezuela) and Africa. The single largest challenge confronting gemologists today is establishing a clear-cut way to differentiate natural green diamonds from treated ones: green diamonds can be submitted to irradiation, both natural and laboratory generated, where the latter emulates the former to such an extent that it is difficult to determine which is which. The most famous green diamonds, which have managed to make quite a statement among the rare diamond collectors, are of different shades and colors. "The approximately 41 carat Dresden Green diamond is the largest, and perhaps the finest, green diamond known to have a color of natural origin." (source: Kane, 1990). The Dresden Green is a 40.70 carat, pear shaped stone with a VS1 clarity grade. It was reported as one of the largest and finest natural green diamond ever discovered. Having such a unique color combination, The Ocean Dream happens to be one of the rarest stones on earth. The diamond is a 5.51-carat, Fancy Deep Blue-Green, Shield-shaped diamond. It is actually the only natural diamond known with this color combination. Another famous Green diamond to make the headlines is actually not strictly a Green color stone. The Chopard Chameleon, a 31.31ct Oval-cut diamond, appears green in bright light but looks yellow in darkness. This stone was actually one of the first stones reported by the GIA as a chameleon back in the late 1950s by a Mr. Peter Kaplan.